It was a tough battle for the 2013 PokerStars.com European Poker Tour London Main Event title, but after all was said and done Ruben Visser walked away with the top prize worth £595,000. The 24-year old Entrepreneurship and New Business Venturing student outlasted seven tough opponents and became the fifth Dutchman to win an EPT title. The first player that was knocked out was also one of the biggest names at the final table. Chris Moorman started the day as one of the short stacks and got his money in with pocket sevens against ace-king. The Brit was up against Team PokerStars Pro Theo Jorgensen who flopped two pair right way. Moorman didn't catch up and took home £57,000. The second, and final, Brit to get knocked out was Tamer Kamel who finished in seventh place for £79,950. Kamel hung around for quite some time, but couldn't find a way to win when his ace-ten ended up all in against Olof Haglund's king-queen suited. Haglund hit a pair and extended his chip lead with six players remaining. Christopher Frank was eliminated in a huge clash against the eventual winner, Visser. The German youngster played a huge preflop all-in pot with ace-king against Visser's nines and the board brought no card higher than a ten. This pot put Visser firmly in second place and Frank walked away with £112,000 in just his second EPT tournament after finishing just short of the money in this year's PCA Main Event. Steve O'Dwyer started the final table as the chip leader, but he fell way short of where he would've liked to have finished. After losing a massive coin flip against Haglund, O'Dwyer ended up re-shoving over a raise from Visser, but Jorgensen woke up behind him with pocket aces. The American pro, who finished runner-up in this event last season, had just ace-deuce and could not catch a lucky break. O'Dwyer added £146,000 to his impressive list of results for his fifth-place finish. There was £140,000 left for the winner, and Haglund was not going to be the lucky one to add more to his big win. It was Visser again with ace-eight when he played a coin flip against the Swede's king-jack. 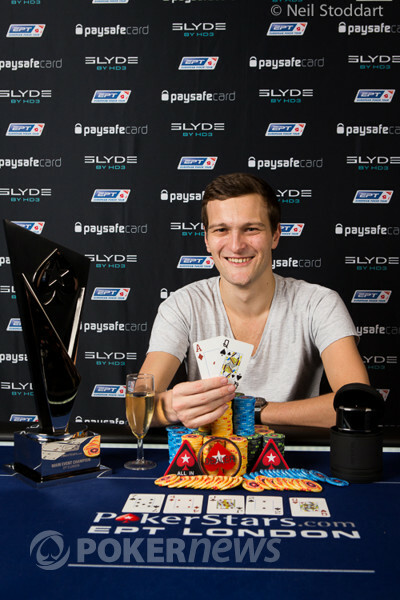 An ace on the flop ended the tournament for Haglund, and he took home £427,564. Heads-up play between Visser and Mantas Visockis took just over two hours, but to the eventual winner it felt like an eternity. Visser started with a huge chip lead, but his Lithuanian opponent almost managed to close to gap. After the second break, Visser quickly regained ground on Visockis, who eventually played a coin flip for his tournament life with tens against ace-queen. The board seemed safe for a Visockis double up, but the queen of hearts on the river changed everything. 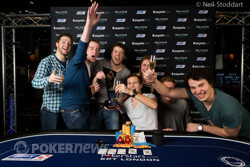 Visser hit a winning pair and took down the EPT London title. Visockis took home £377,436 for his second-place finish, but the big winner was Visser, who added £595,000 to his poker résumé. With this victory, Visser moved up to the fifth place on the Dutch all-time money leader board behind previous EPT winners Constant Rijkenberg, Rob Hollink, Pieter de Korver and Team PokerStars Pro Marcel Luske. PokerNews.com will be back on the next EPT stop in Berlin, which will take place from March 5-16. After a day of flips the tournament had to end in a flip, a flip that made Ruben Visser 5th Dutch winner of an EPT. 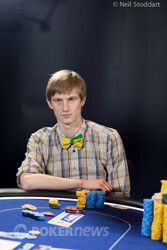 Visser opened to 250,000 and snap called when Mantas Visockis three-bet all in for around four million. The board ran to see Visser make a crucial pair on the river. Mantas Visockis raised to 260,000 from the small blind and Ruben Visser replied by three-betting to 710,000. Visockis made the call and the flop brought . Visser fired out 650,000 and took down the pot. Ruben Visser didn't enjoy the last level much but this level has gotten off to a much better start for him. He opened to 250,000 and Mantas Visockis called to see an flop where he check-called a 250,000 bet. On the turn both players checked to the river. Visser bet 700,000, and opened , when Visockis checked to him again. Visockis called and mucked. Play will resume in 15 minutes. Welcome Back to EPT London, Final Table!